Ceredigion is the least affordable area to live in Wales, according to a new survey. The research, carried out by The University of York, found house prices in the county were more than six times the average household income. While house prices in Cardiff and Monmouthshire were higher, the study said Ceredigion's low average incomes made home ownership more difficult. The average house price to income ratio for Wales as a whole was 3.54 to one. Blaenau Gwent has the lowest ratio at 1.99. The York University study, called Home Ownership in Wales, focused on average two or three-bedroom homes at the end of 2003 and the average earned income of households aged from 20 to 39. Ceredigion's average house price in the period of the study was £120,041, compared to an average household income of £18,894 - a ratio of 6.35 to one. 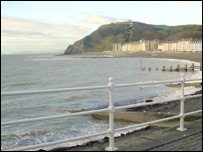 With four districts in the south west of England had ratios higher than Ceredigion, the county has the fifth-highest ratio in England and Wales. Its ratio is also higher than any London borough with Westminster coming closest with 6.17. The study was made by Professor Steve Wilcox at York University. He said: "Ceredigion is an attractive coastal area, where demand for holiday accommodation, second homes and retirement housing, as well as the demand for student housing, all add to the pressures on the local housing market, and push up prices relative to local earned incomes." Mr Wilcox added that Ceredigion has the lowest proportion of council or housing association homes of any county in Wales. The data for the survey came from figures from the Survey of Mortgage Lenders, the Expenditure and Food Survey, the Inland Revenue and the Labour Force Survey. In Wales as a whole, the ratio of the average earned household income (£25,936) to the average house price of £91,713 is 3.54 - lower than the England average of 4.11. As well as in Ceredigion, the ratio exceeds four to one in Cardiff (4.99), Conwy (4.72) and Denbighshire (4.15). In seven local authority areas of Wales, the income to house price ratio is less than three to one. Alongside Blaenau Gwent (1.99), the other low ratios were: Merthyr Tydfil (2.28), Rhondda, Cynon Taf (2.70), Neath Port Talbot (2.78), Caerphilly (2.91), Torfaen (2.92) and Bridgend (2.99). Your views: should house prices fall?